… a lovingly curated selection of the essentials you need for living in the City of Lights – prepared by people in the know. Looking for a party venue or a medical specialist? A place to pamper yourself or activities for your kids? We list only “les bonnes adresses” that have been tried and tested by INSPIRELLE‘s network of trusted friends. Check back often, as we’ll keep adding new ones! 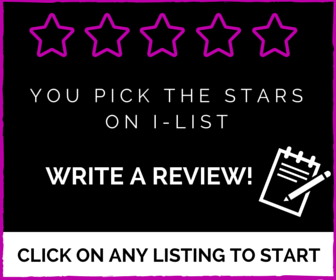 If you have a business you would like to recommend adding to the I-List, please get in touch! How to Get Everyone in the House to Clean Up the Mess! Man in the Kitchen: What Does He Really Think About Valentine’s Day? Whether you want to just say bonjour, you have questions, recommendations or comments on how we’re doing, feel free to drop us a line. Interested in advertising or a promotional partnership with INSPIRELLE? Contact us for more information. What could be a better way of getting a bird’s eye view of Paris than to soar over the city in a hot-air balloon? Le Ballon de Paris has a montgolfier waiting for you in the Park André Citroen. Blast straight up 150 meters for an eye-popping aerial view of the French capital. Don’t forget to check the weather first! A charming village located just 80 km West of Paris, Giverny’s picturesque gardens were the source of inspiration for Impressionist painter Claude Monet’s most esteemed works from 1883 until his death in 1926. The gardens and restored house have since become a pilgrimage for artists, tourists and nature lovers alike. After a peaceful stroll through the cascades of flowers and weeping willows, take a short walk over to Le Jardin des Plumes, a Michelin-starred restaurant serving dishes as beautiful as the surrounding scenery. Or, lunch in one of the many quaint local restaurants near Monet’s house. Complete the day with a visit to the fabulous Museum of Impressionisms in the village. This beautiful park, located in the 6th arrondissement of Paris, covers 23 hectares and is known for its lawns, tree-lined promenades, and flowerbeds. The model sailboats on its circular basin will keep the kids busy for hours. For children, there’s an enclosed playground (small entry fee), a famous carousel with brass ring game, tennis and basketball courts, and pony rides. At this zoo, also known as the Vincennes Zoo, imagine you’re in the savanna, Patagonia, or in the tropical climates of Guyana and Madagascar. All year round, you can come here to encounter more than 180 animal species kept in conditions as close to their original habitat as possible. The American School of Paris (ASP) in Saint Cloud, a western suburb of Paris, is a great place for families to find innovative activities and holiday camps in English. Through its Extension Program the private, international school opens its world-class facilities to external students aged 4 to 18 during school vacations as well as Wednesdays and Saturdays throughout the school year. Camps and year-round activities led in English include basketball, tennis, soccer, coding, science, fashion design, filmmaking, theatre and more. Kids looking to improve their English skills have a choice of English immersion classes and even intensive workshops to prepare for the English BAC exam or the SAT American college entrance exam. At ASP, there’s bound to be a camp or workshop right for your child. Check out their WEBSITE for all the details! If you love some of INSPIRELLE‘s portraits and Paris photos, turn to professional photographer Alexis Duclos. One of our most fervent supporters, Alexis is an experienced award-winning photographer and video cameraman who can capture your individual and family portraits for business or personal use as well as produce corporate videos to enhance your company websites. The merveilleux (marvelous) is a small cake that originated in Belgium and is now found in France and some US cities. Baker, Frédéric Vaucamp, fell in love with the cakes at an early age. His famous cakes are now sold in 5 locations in Paris as well as numerous other locations across Europe and in New York City. Grab your bathing suits and head to the largest aquatic park in Europe — equipped with indoor and outdoor pools, jacuzzis, numerous large water slides and a wave pool. It’s an all-year-round fun attraction for everyone, and a great place to plan a kids’ birthday party! The complex also includes restaurants, a fitness center, Decathlon sporting goods store and movie theaters. Also mentioned in our ultimate guide to kid’s activities! A team of “mad scientists”, who make learning about science fun, are at your service to put on a fun and engaging, interactive show at your event or children’s party. Choose from various age-appropriate themes, and they’ll come prepared to entertain the kids with fun scientific experiments. You just provide the laboratory and the cake. Also offering made-to-measure workshops on numerous science topics in schools and at various Savants Fous locations around France. They also organize daily and weekly workshops during school holidays. This large chain with 250 stores in France and around Europe, offers a huge variety of styles for all your home decorating needs. Whatever your preference the Maisons du Monde’s own team of furniture designers imagine their exclusive and unique collections of furniture and decor each year in 3 different catalogues – indoor, outdoor, and junior. Apprendre à coder pour apprendre à créer (learn to code to learn to create) is the slogan at Magic Makers. You can find coding classes and workshops for children 8 yrs and up. Magic Makers offers an innovative way of teaching code as a form of creativity. Madura creates collections with the aim to give pleasure and to make interior design easy, enjoyable and approachable. Together with their vast range of textiles, they also offer a wide selection of lamps, blinds and other accessories. Numerous locations in Paris, around France, Europe and New York City. Underground parking and valet parking available. The spanking new Beaugrenelle shopping center is one of our favorite one-stop destinations in central Paris: a 50,000m2 modern shopping center and cinema complex in the 15th arrondissement. Shoppers, You’ll find some of your favorite brands. Hungry? Try the food court which offers a range of family-style restaurants. A multiplex Gaumont Pathé cinema offers online bookings with your choice of seating–including love seats for snuggling up to someone. Want to drop off your kids while you shop? Viens Jouer à la Maison offers workshops and an indoor playroom with regular activities to keep your little ones busy on Wednesdays and weekends! Look for more activity ideas in our Guide to After School and Weekend Activities or in 15 Indoor Activities for Children in Paris on Rainy Days! You know Zara Women’s and Men’s affordable clothing stores so visit the chain’s home furnishings boutiques throughout Paris. Discover attractive collections of small furniture, decorative objects for the bathroom and kitchen and a textile selection (bed linen, tablecloths, towels, throw covers). Known for their manis and pedis, My Color also has a Beauty Bar where you can get 30-minute flash facials, which include a remise en beauté to touch up your hair and make up before you head out for a night on the town. They also do waxing (épilation). Who doesn’t like to bowl? There are several bowling alleys in Paris for great family fun, from the Bowling Mouffetard to Bowling Foch near the Champs Elysées, or the child-friendly lanes at Front de Seine in the 15th arrondissement which has lightweight balls for little ones 5 years and up. Bowling is a great birthday party option as well. Check the lanes nearest you for their party packages. Established over 40 years ago as an independent and not-for-profit organization, all of their teachers hold AMI (Assoication Montessori Internationale) diplomas. The school offers a unique bilingual Montessori education, at 3 locations in the heart of Paris, for children from 2-9 years old. Founded in 1954, École Jeannine Manuel has now become the largest non-denominational independent school in France. With a mission to promote international understanding through the bilingual education of a multicultural community of students and parents, they now educate 2,900 students, representing over 65 nationalities, between their Paris and Lille locations. For new non-French speaking students beginning in CE1 (~age 7) and up to seconde (~age 15), enrollment takes place in “adaptation” classes where they follow a one-year French immersion program. Further special instruction in French continues for another additional year including three additional hours of French each week and individual support, as required. They have 4 locations in Paris and boarding opportunities at their Lille, France location. Known for its crispy Peking Duck served over several courses, the Palais du Bonheur serves up typical grilled and steamed Chinese dishes — all for a reasonable price, with a welcoming smile! Our faves: Peking duck of course, salt and pepper shrimp, ma po tofu, braised eggplant and hot and sour soup! A French and English-speaking American trained clinical psychologist with a PhD specialising in behavioral issues, ADHD, parenting, anxiety and mood disorders, OCD and behavioral medicine. Member of SPRINT France, a non-profit group of English-speaking and bilingual professionals who work with children of all ages with special needs. A British-born and educated clinical psychologist working with adults, children and families, with a particular interest in the autistic spectrum. One of Paris’ oldest Anglophone associations bringing together expats, new and old, through year round cultural, educational and social activities and events. WICE keeps the mind sharp, the body active and the spirit alive. Join the internationally known writer’s workshop, book club, learn a language or participate in an art class, walking tour or wine tasting. Based in the 16th arrondissement of Paris, Club Atheon offers adults and children a wide variety of sports and fitness courses throughout the year, including martial arts, pilates, yoga, zumba and more. During school holidays, they hold one-week multi-sports, dance and English class workshops (only during school holidays) for kids aged 7-15 at Stade Jean Bouin in the 16th arrondisement.